Howard and Anne Elsberry of Leawood, Kan., both 1964 graduates of Truman, have established an annual scholarship program at the University. The Howard and Anne Elsberry Opportunity Scholarship in Business will award $6,000 annually in scholarship resources during the next five years to students studying business administration. Two $3,000 scholarships will be presented, starting with the spring 2007 semester, to Missouri natives with financial need, leadership potential and demonstrated community and campus service. Preference will be given for dependents or employees of Westlake Hardware. Howard Elsberry is the president and chief executive officer of Westlake Hardware, the nation’s largest Ace Hardware dealer with 83 stores in a seven state region of Missouri, Kansas, Nebraska, Iowa, Oklahoma, Texas and New Mexico. The company, formed in 1905, celebrated its centennial last year. Anne Elsberry is senior vice president and general counsel for Westlake Hardware, and is a member of the Truman State University Foundation Board of Directors. For information on how to apply for the Elsberry Scholarship, please contact Becky Pike at Truman’s Office of Advancement, 785.4133 or you may e-mail her at bpike@truman.edu. Truman has been recognized by three publications recently. Ashley Rufus, a sophomore chemistry major from Chillicothe, Ill., was recently featured in Time magazine’s article “Who Needs Harvard?” in the Aug. 21 issue. Rufus was spotlighted for giving up her coveted spot on Harvard’s waiting list to attend Truman instead. Rufus, who received a full-ride to Truman, made her decision to attend Truman to avoid eight years of debt for both undergraduate and graduate studies. She was also impressed with the small student-faculty ratio and the “very impressive” rate of acceptance to medical schools. For the 10th year in a row, Truman State University has been recognized as the No. 1 Public University in the Midwest Region–Master’s Category by U.S. News & World Report’s “America’s Best Colleges 2007.” Truman also was ranked No. 8 overall in the Midwest region among both private and public institutions. Truman is the only public university in Missouri to be included in the top 10 public university-master’s ranking. The Midwest region category includes Illinois, Indiana, Iowa, Kansas, Michigan, Minnesota, Missouri, Nebraska, North Dakota, Ohio, South Dakota and Wisconsin. Truman was also highlighted as having two programs, The Senior Capstone and Undergraduate Research, which are considered outstanding academic programs that lead to student success. U.S. News & World Report based its regional master’s rankings on graduation and retention rates, faculty resources, student selectivity, financial resources, alumni giving, and peer assessments among those institutions whose focus is mainly undergraduate and master’s-level programs. Truman State University offers students an outstanding undergraduate education, according to The Princeton Review College Guide’s 2007 edition of “The Best 361 Colleges.” Truman is among a select group of schools featured in the latest edition that looked at academic programs, institutional data, feedback from students at the schools, and visits to schools during the years. Opinions of independent college counselors, students and parents were also considered. Efforts were made to have a wide representation of colleges in the book by region, size, selectivity and character. Truman also ranked No. 5 in the category “Students Happy With Financial Aid.” More than 97 percent of incoming freshman receive a University scholarship and/or federal financial aid. Only about 15 percent of the four-year colleges in America and two Canadian colleges are in the book. The book contains two-page profiles on each University listed. Students who do not have a car can use Kirk-Tran for transportation. Kirk-Tran is the public transit service administered by the City of Kirksville. Kirk-Tran operates a new fixed route service that stops at assigned destinations around town Monday through Friday from 7 a.m. to 6 p.m. Kirk-Tran costs $2 for each time a passenger boards the vehicle. A bus stop is located near Centennial Hall at Franklin and Randolph Streets. Students will be able to travel to destinations such as Hy-Vee and Wal-Mart. The bus schedule is available on the City’s Web site at http://www.kirksvillecity.com and will be available at each of the stops. To serve those who are not able to utilize the fixed route, there is a demand-response service available. Reservations may be made by calling 665.8404 in Kirksville, and toll-free 1.877.666.KIRK (5475) outside of Kirksville, Monday through Friday from 8 a.m. to noon and from 1 p.m. to 3 p.m.
Truman State University’s chapter of the National Collegiate Hispanic Honor Society has been chosen for the prestigious Ignacio and Sophie Galbis Award, presented annually to the most outstanding chapter nationwide for activities realized during the academic year. Each May, all 540 chapters of Sigma Delta Pi are asked to submit an annual report detailing their numerous activities and projects from the academic year. Based on these reports, the National Executive Committee chooses approximately 15 “Honor Chapters” annually. This recognition is based upon the caliber of chapter projects that reflect the Sigma Delta Pi mission of honoring excellence in the study of the Spanish language, contributing to cultural understanding and upholding the goals of the Society. Lucy F. Lee, Truman’s chapter adviser and 2004 recipient of the José Martel Award for the most exceptional chapter adviser for the 2001-04 triennium, was instrumental in earning this highest chapter-honor of Sigma Delta Pi. With its national office at The Citadel in Charleston, S.C., Sigma Delta Pi is a member of the Association of College Honor Societies, the nation’s only certifying agency for college and university honor societies. One of the biggest challenges for international students in the U.S. is homesickness. That pervading sense of loss of family support combined with the overwhelming cultural and educational differences makes it very difficult for new international students to adjust and focus on their academic success. The International Student Affairs Office is seeking families to match with international students for friendship and mentorship. This is not a homestay program. Families are encouraged to include their international student friend in facets of their everyday life and fun activities with a minimum of one interaction per month. Families of all shapes and sizes are encouraged to participate. People may take advantage of this great opportunity to learn about another culture and make a real difference in the life of a future ambassador of goodwill for America. For more information, call Melanee, Reon, Jenny or Kate at the International Student Affairs Office at 785.4215 or e-mail intladmit@truman.edu. 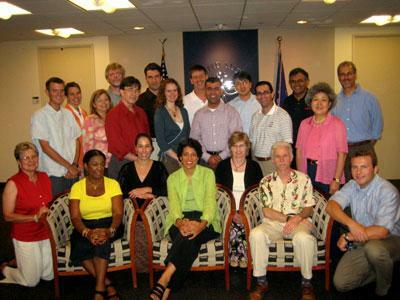 Marijke Breuning, associate professor of political science, (pictured front row, third from right) participated in the United States Institute of Peace 2006 Faculty Seminar “Global Peace and Security from Multiple Perspectives.” This seminar focused on the new international security environment, approaches to managing conflict and new ways of teaching global peace and security at the undergraduate level. It took place at the U.S. Institute of Peace July 25-30 in Washington, D.C.
UHY Advisors has established an annual scholarship program at Truman State University, starting with the 2006-07 academic year. A $1,000 scholarship will be awarded to a student admitted to the master of accountancy program with financial need, a cumulative grade point average of 3.2 or higher, and active involvement and leadership in extra-curricular activities. UHY Advisors delivers professional financial, tax and business services to mid-size and larger companies. A global company, the firm has 20 offices in the United States, including St. Louis. The managing director of the firm’s St. Louis office is Rod Cooper, a 1988 Truman graduate. Students interested in a part-time job this semester are encouraged to apply to work with the Tel Alumni campaign. Tel Alumni is hiring between 20-30 students to work for 12 weeks. No experience is necessary, but they are looking for students who have good communication skills, an outgoing personality, a strong work ethic, and a willingness to ask parents and alumni for financial support. Students must be available to work at least two of the following shifts each week: Sunday, 4-7 p.m.; Monday, 6-9 p.m.; Tuesday, 6-9 p.m.; Wednesday, 6-9 p.m.; or Thursday, 6-9 p.m.
Tel Alumni offers nightly prizes including items such as gift certificates, clothing and food; a relaxed, fun environment; paid training; a flexible schedule and an hourly wage of $5.30. Scholarship and work study positions are also available. Tel Alumni is an excellent résumé builder for students majoring in fields such as business and/or communication. Students may pick up an application in the Advancement Office, McClain Hall 100. The application deadline is Sept. 5. Contact Brad Neathery at 785.7432 or neathery@truman.edu for more information. Organizations, departments and outside vendors will display the services they have to offer to students. Free add/drop for full-term and first block courses ends at 11:59 p.m. on Friday, Sept. 1. Students may add and drop courses via TruView, or make changes in person in the Registrar’s Office between 8 a.m.-5 p.m. New students must obtain a Registration Access Code from their academic advisor to add/drop via the Web. A $50 add/drop fee will be assessed for any schedule change made after the free add/drop period ends, regardless of the reason for the change. Students living off-campus should update their local mailing address with the University via TruView. Address changes can also be made in the Registrar’s Office, McClain Hall 104. Students are responsible for all information sent to their local mailing address from University offices and personnel conducting University business. Returning students who completed courses at other colleges or universities during the summer semester need to send official transcripts for this work to the Registrar’s Office by Friday, Sept. 29. If you have already sent a transcript to Truman, check your transcript on TruView to be sure that this credit appears correctly on your records. The tentative spring 2007 schedule is now available via TruView. To view the schedules, select “search open course list” from either the student or the faculty tab. Graduation applications for undergraduates who entered Truman before the fall 2004 semester and who plan to graduate in May 2007 are due in the Registrar’s Office by Sept. 8. Applications and degree worksheets are available at http://registrar.truman.edu. The tentative spring 2007 schedule is available via the TruView open course list to help you complete your application. Graduation applications for undergraduates who entered Truman during or after the fall 2004 semester and who plan to graduate in May 2007 will be processed using the degree audit system. Applications for these students may be submitted between Oct. 24 and Dec. 1. December 2006 Undergraduate Degree Candidates If you have made any changes in your course schedule(s) since you submitted your graduation application and have not yet updated your application with the Registrar’s Office, you need to do so immediately. Updates can be made in the Registrar’s Office, McClain Hall 104, Monday through Friday between 8 a.m.-5 p.m. You do not need to complete a new application. To remain on the graduation list, all changes to your degree plan and all required substitutions must be on file in the Registrar’s Office no later than Sept. 29. “I want to start exercising and changing my diet, BUT…” Many people want to make changes in their exercise and diet behavior and just have a difficult time getting started or getting anything to stick. Not enough time; not enough will power; just no motivation. This September a new program is being offered for people who would like to become more regularly active and eat healthier, BUT! TruFit Wellness Group is a 12 week education program focused on teaching group members skills needed to empower lifetime health behavior changes. Group members will learn: planning strategies for change, goal setting for success, nutrition tips and concerns, physical activity benefits and options, overcoming obstacles, using social support, combating negative thoughts, and creating their own motivation. Any Truman faculty and staff who are at least 20 pounds overweight and not currently engaging in regular physical activity is encouraged to join. Meetings will occur in a group format and will be offered on Tuesday evenings starting Sept. 12. This is a cost-free group being offered as a service to the faculty and staff of Truman State University. If you are interested in learning more about the group or would like to sign up, contact Jennifer Hurst by phone at 785.4464 or e-mail jhurst@truman.edu. Explore the Objects of Ancient Mesopotamia at http://library.truman.edu/gallery/Cuneiform/Exhibit/cuneiform.htm. See the real thing at the Special Collections Department. Go to http://library.truman.edu/departments/specialcollections.htm for more information. Wear your purple and white in honor of College Colors Day. Gov. Matt Blunt has proclaimed Sept. 1, 2006, as College Colors Day, which coincides with “back to school” and the kick-off of fall intercollegiate activities on college and university campuses. College Colors Day seeks to celebrate and promote the traditions and spirit that make a great college experience by encouraging fans, alumni and students to wear apparel of their favorite college throughout the day of Sept. 1, 2006. Erin Clark, a senior major from Lincoln, Ill., earned a first-place award in the 2006 Illinois Associated Press Editors Association Editorial Excellence contest for entertainment writing. Clark was an intern for the Lincoln Courier, which competes with daily newspapers in Illinois that have a circulation of 15,000 or less. Matthew Datum, a senior business administration major from Joplin, Mo., has passed the Japanese Language Proficiency Test Level 2. Masahiro Hara, associate professor of Japanese, presented a paper titled “Transfer in Parsing Strategies” at the International Conference on Japanese Language Education 2006 located at Columbia University in New York City on Aug. 5-6. John Ishiyama, professor of political science, and Krystal Fox, a senior political science and economics major from Bellevue, Neb., had their article “What Affects the Strength of Partisan Identity in Sub-Saharan Africa?” accepted for publication in the journal Politics and Policy. The article will appear in the December 2006 issue of the journal. John Ishiyama, professor of political science, Marijke Breuning, associate professor of political science, and Linda Lopez of the National Science Foundation had their article “A Century of Continuity and (Little) Change in the Structure of the Undergraduate Political Science Curriculum” accepted for publication in the American Political Science Review. Thomas Trimborn, professor of music, recently presented a lecture “Encounters With Lincoln” at the Lincoln Museum in Fort Wayne, Ind. Based on his book of the same title published by the Truman Press, he concluded with a PowerPoint presentation of his Lincoln portraits accompanied by a recording of the “Battle Hymn of the Republic,” the music most associated with the martyred president. Trimborn also had an exhibition of his book’s original art in the Old State Capitol Building in Springfield, Ill. Officials state that 40,000 visitors toured the exhibit from late April through the closing on July 1, 2006. The parking lot south of the Student Union Building (SUB) is now closed due to renovations beginning at the SUB. The Public Relations Office (McClain Hall 101) is selling small, medium and large purple Truman Spirit T-shirts for $5 each. Call 785.4016 for more information. Truman’s Staff Council Spirit Committee is selling Truman Spirit wristbands for $1 each. The purple and white wristbands can be purchased from Kimberly Titus in the Registrar’s Office, McClain Hall 104, or from Katie Best in the Public Relations Office, McClain Hall 101. Proceeds will go toward future Truman related spirit functions. The Adair County clerk is going to remove nearly 1,700 voters from the polling lists if the people fail to contact the office before the next general election, which is Nov. 7. Anyone who has not voted in the previous two presidential elections qualifies to be removed from the polling list. Inactive voters must contact Adair County Clerk Jim Lymer before Oct. 11 to vote in the upcoming election. For more information, contact Lymer at 665.3350. Athletics is now selling season football tickets. Cost for faculty/staff is $30 and can be purchased from the http://gobulldogs.truman.edu Web site. Ekklesia, Truman’s campus outreach of the Kirksville Church of Christ, is sponsoring a visit from former professional football player Willie Franklin. Franklin will teach an informal class at 7 p.m. Aug. 29 in the Ryle Hall Main Lounge. Franklin played football for Oklahoma State University and professionally for the Rams and Colts. He now speaks to college students and urges them to make spiritual goals. He will also have a keynote address at 7 p.m. Aug. 30 in the Baldwin Hall Little Theatre. Devotional lunches are planned Aug. 29-30 in the Ryle Hall Private Dining Room. Franklin will also be at the Ekklesia booth at the Truman Activities Fair on Aug. 30. Ekklesia will be giving away hand held purple fans shaped like football helmets that say “Tru-Fans.” Contact Barry Poyner at 785.4063 or bpoyner@truman.edu for more information about Franklin’s visit. During the summer as part of the Summer Reading Program, Student Senate and the Residential College Program invited all members of the Truman community to read “Kite Runner” by Khaled Hosseini and/or “Travels of a T-Shirt in the Global Economy: An Economist Examines Markets, Power, and Politics” by Pietra Rivoli. Those who read the book are invited to join the organizations for discussion of these books at 7 p.m. Aug. 29 in the SUB Lounge (201) and/or Aug. 31. “Kite Runner” will be discussed Aug. 29 and “Travels of a T-Shirt” will be discussed Aug. 31. For more information on the Summer Reading Program, please consult the Summer Reading Web site at http://summerreading.truman.edu. All women interested in going through sorority recruitment can sign up from 11 a.m. to 2 p.m. Aug. 30 at registration tables located in Centennial Hall, Ryle Hall, Violette Hall, and the Student Union Building. E-mail panhellenic_council@yahoo.com for more information. College Republicans will have a special meeting from 7:30-8:30 p.m. Aug. 30 in Violette Hall 1010. State Rep. Bob Behnen, a candidate for State Senate, will be attending this first meeting of the year. Contact Taylor Burks at 417.592.4214 or twb209@truman.edu for more information. The faculty/staff red parking decals expire on Aug. 31. Renewal letters have been distributed to the division/department offices. Please check and verify all information on the renewal forms and return to DPS. Parking Services hours are Monday through Friday from 7:30 a.m. to 2:30 p.m. Parking Services can be contacted by telephone at 785.7400. The Campus Christian Fellowship is sponsoring a worship concert with Shane and Shane from 7-10 p.m. Aug. 31 on the South Field (Rugby Field). Contact Mark Swanson at 665.5772 or mgswanson@gmail.com for more information. Go to http://www.shaneandshane.com for more information about the band. The Truman State University Division of Fine Arts presents a revival of the summer production “The Good Doctor” at 8 p.m. Aug. 31-Sept. 2 in the James G. Severns Theatre located in Ophelia Parrish. This is a comedy in two acts by Neil Simon. Admission is free. The Women's Club Soccer team will be having try-outs from 4:30-6:30 p.m. Sept. 5 behind Centennial Hall. E-mail the club at tsuclubsoccer@hotmail.com for more information. Students in Free Enterprise (SIFE) will have several informational meetings for students to learn more about joining the award-winning organization. The group will meet at 6 p.m. Sept. 5-7 in Violette Hall 1416. Contact Bethany at bnn939@truman.edu for more information. The Weekly Lunch Series for faculty and teaching staff begins the fall semester with a session from 12:30-1:30 p.m. Sept. 6 in the SUB Alumni Room. Truman’s campus representative for the American Democracy newspaper project will show those who attend the many ways the New York Times, St. Louis Post-Dispatch, and USA Today may be incorporated into classes and co-curricular experiences. In addition, people will get a peek at the special resources available for faculty and instructional leaders. Those who attend can sign the sheet at checkout to receive up to $3.00 toward their Sodexho meal. Panhellenic Recruitment begins with Panhellenic Welcome from 7-9 p.m. Sept. 6 in the Student Union Building Activities Room. All female students interested in recruitment need to register prior to Panhellenic Welcome. E-mail panhellenic_council@yahoo.com for more information. The American Association of University Professors (AAUP) will meet at 4:30 p.m. Sept. 8 at the University Club. Contact Marc Becker at 785.6036 for more information. All faculty and staff are invited to the Welcome Back University Club Fall Picnic from 5 p.m. to dark Sept. 9 at the University Club, 516 E. Patterson. Those who attend should bring a dish to share with barbecue meat and beverages provided. Redwing will perform. Families and friends are welcome. Campus events are also available on the Master Calendar located online at http://www.truman.edu/pages/284.asp.